Every month, I shall be featuring a revolutionary scientist for helping you people get to know these great minds better. For the first edition, I feature Stephen William Hawking. Who is Stephen Hawking ? Stephen Hawking ( 8 January 1942- now) is a Theoretical Physicist, Cosmologist, author and Director of Research at the Centre of Theoretical Cosmology within the University of Cambridge. He unified general relativity and quantum mechanics to explain Cosmological theories. His works, including the Hawking Radiation, is compared to the works of giants including Einstein and Newton. He is a supporter of the many-worlds interpretation of Quantum Mechanics. He has held the prestigious position of the Lucassian Professor of Mathematics at the University of Cambridge. Previous holders include Sir Isaac Newton, Charles Babbage, Paul Dirac, etc. He is the author of the bestseller. The Brief History of Time, a popular science book explaining range of subjects in the field of Cosmology, the physics of the Universe as a whole. He was just an average student, but was nicknamed Einstein by his friends for his intelligence. As most of us math and science fans, he also was against the system of rote learning. As a considerable aptitude towards physics, he liked building working models. He later remarked that this very hobby helped him in research, as "Knowing the Physics of the Universe, is in a way, operating it!" His father wanted him to study Medicine initially, and didn't allow him study mathematics in the fear of dearth of mathematical jobs. Hawking later suffered for this very choice of his father. Another interesting fact, Hawking was born exactly 300 years after the death of the Astronomer and Physicist Galileo Galilei, and one of my friends on Brilliant, Anik Mandal was also born in the same day! These were some interesting facts about Professor Hawking, hope you enjoyed! My memory, I know a lot about him. That is kind of an oxymoron. An average student with higher than average intelligence?! The sad truth is that I've countless acquintances who are also being forced to choose Medicine over Math due to peer pressure and family pressure. This really upsets me. I've talked to them, and what I found was that they chose medicine because they were subconciously manipulated by their parents. I wish he had Brilliant.org when he was a teenager. He unified general relativity and quantum mechanics to explain Cosmological theories. Are his theories still unchallenged and accepted? Could you tell us more about what his theory was? 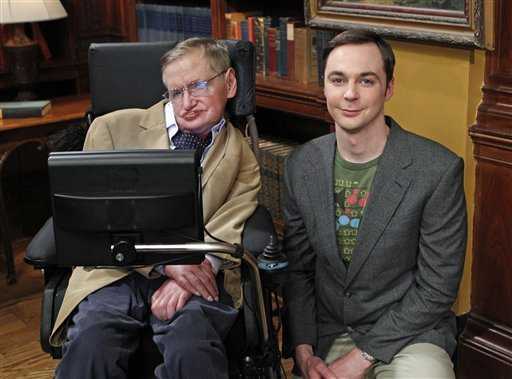 Did you know Hawking appeared in a large number of TV Shows and films including The Big Bang Theory, Star Trek and Futurama? Average student: Not a hundred on hundred on student, just gets moderate marks in exams, and gives them just in order to qualify for the next grade. Coming soon, around 15th of August. I donno if you remember me, but we had a few conversations years ago, so I take the freedom of asking you a question. Being a student of CMI, what opinion could you form of its Physics department? I want to pursue my career in mathematical physics, so I think CMI could be a nice option. Please throw some light.